St. Louis, Louisiana (USA) -- Learning about a great faith through its art is an appealing introduction, said John Renard, a professor at the Saint Louis University theology department, when asked about the Pulitzer Foundation's "Reflection of the Buddha." 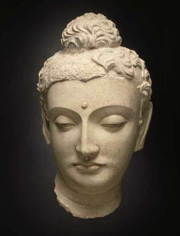 Head of Buddha Sakyamuni, 4th century, Afghanistan, ancient Gandhara region, probably Hadda. Stucco with traces of pigment. 18 x 10 1/2 x 9 3/4 in. Over the years, he's taught courses in both Buddhism and Hinduism that link each faith's theology to its art. When most SLU undergraduates signed up for his class Buddha Religion and Art "most knew almost nothing about it, just that it was exotic," he said. Renard150JohnSLULike most Americans, his students' chief image of the Buddha was the smiling seated man in restaurant shrines. Renard (right) himself remembers his teen years in the heyday of Gaslight Square in the CWE when he was too young to enter bars. He and other youth (including this author), got warm welcomes at the area's only coffee shop "The Laughing Buddha." Renard broke it to his students that the laughing man was really not the great Buddha, who founded the religion. "Actually it's Buddha transmogrified, it's Pu-Tai," he said. That laughing Buddha is based on a Chinese story of a man called Ch'i-t'zu, later nicknamed Pu-tai, which means hemp sack. The man, a protector of children, carried sweets and goodies for kids in a sack. The image is also a good luck charm to bring wealth. Nearly all religions accrue folk customs; and today many Asians consider it good luck to rub Pu-Tai's large stomach. Renard was pleased to see the familiar terra cotta Buddha head on loan from the St. Louis Art Museum. "See how he's influenced by the Greeks, after the arrival of Alexander the Great," Renard said looking at the image on the foundation's website. "He's serene. (The sculptor ) understood what the master said." In the early history of Buddhism, there were no images of Siddhartha Gautam. "At first they were opposed to showing him," Renard said. "They used an earthen mound, a bowl or sometimes hung a robe." Then, they showed relics, stupa, which often hold crystal-like "pearls" that are found among the ash and bones after a human body is cremated. After the invasion of Alexander the Great, Buddhists began to create Buddha images. The idea of having a Buddha image travelled along with the spread of the Buddhist religion into China, Korean and finally into Japan by the 6th Century, Renard said. Each culture used its own style, crafts and favored materials to create their Buddha images and images of other master teachers, he said. The isolated Himalayan kingdoms of Sikkim, Nepal and Tibet, produced quite different images from each other, he said. Renard said he is delighted that images from the Nelson-Atkins Museum of Art will be in the exhibit since he always regretted its collection in Kansas City was too far for a class field trip. Although works from Nelson-Atkins, Harvard Art Museum and other museums will be on display just two blocks from the university, the school's not offering the class this year. But no doubt some students will find their way. Don Sloan, a lay leader at the Mid-America Buddhist Association, expects "Reflections of the Buddha" at the Pulitzer to draw good crowds based on his experience with organizing the local stop of a traveling exhibit of Buddhist relics. Shown at Washington and Webster universities, it drew 2,000 to 3,000 persons, he recalled. "People will come to see this," he said. "It's good for the Buddhist community." The exhibit opens at the Pulitzer on Sept. 9 and runs through March 10. To read more about the exhibit, go to "Take Five: 'Reflections of the Buddha' curator talks about the permanence of change" and Buddhists look forward to Pulitzer show.